I have tested LG 43UF6400 vs 49UJ6300. This review will compare their characteristics. The 43UF6400 model (2015 year) belongs to the UF6400 series and the 49UJ6300 model (2017 year) is from the UJ630 series. These are mid-priced TVs. They both use the IPS type display that outputs clear image with bright colors. These TVs uses the Direct LED backlight technology. These models support the 4K standard, with the TruMotion 120 technology. 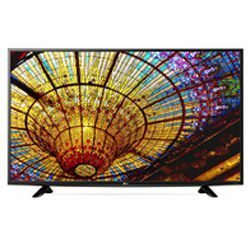 The effective refresh rate of LG 43UF6400 is 120 Hz versus 60 Hz that LG 49UJ6300 has. The color vividness is achieved via the HDR technology. However, 49UJ6300 use the true color accuracy technology that corrects colors and makes them richer, it also has the active HDR feature. Comparing LG 49UJ6300 vs 43UF6400 in terms of the software the TVs use, we see that LG 43UF6400 has webOS 2.0 while LG 49UJ6300 uses webOS 3.5. Both models can access numerous online services. LG 49UJ6300 is energy star qualified. It meets the energy efficiency guidelines. Both models have built-in speakers. 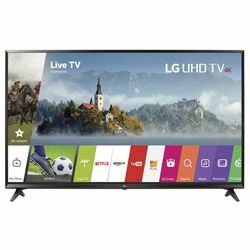 These TVs can open and play properly various audio and video formats. The processor assures a stutter-free playback. They have a very similar design with stable Y-shaped stands (around 2-3 in high). These models can be also wall-mounted. Both TVs have a very thin frame. The dimensions are 38.42x24.48x8.2 in for LG 43UF6400 and 43.7x27.79x9.29 in for LG 49UJ6300 (with stand). These TVs are built well, no gaps, nothing shakes. The ports can assure a perfect connection so you will have no noise. LG 49UJ6300 has 3 HDMI ports and 2 USB ports, while LG 43UF6400 has only 2 HDMI and 1 USB port. The TV is easy to install and setup. The UI is user-friendly so you can easily tweak the settings you need. The output image quality is good – it is clear and sharp. Sometimes, you may experience issues with the Wi-Fi module (it is very slow or you lose connection eventually). Some customers claim that the contrast is poor. The quality of the video is very high – it is clear and sharp with good color vividness. The remote controller is very ergonomic, plus it has the Netflix and Amazon buttons for quick access. High-performance – the TV switches applications within a second. The TruMotion technology can make the video quality worse (you can turn it off in the menu).